Summary: This is a wonderful walk of much contrast. 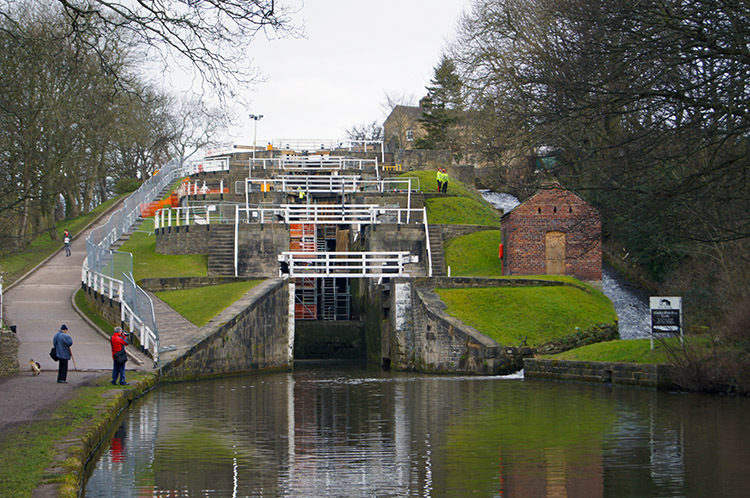 It begins with a walk along the Leeds and Liverpool Canal past Salt's Mill to Bingley and the famous Bingley Five Rise Locks before leaving the canal and passing through Bingley to climb to Druid's Altar and then on to Harden Moor. 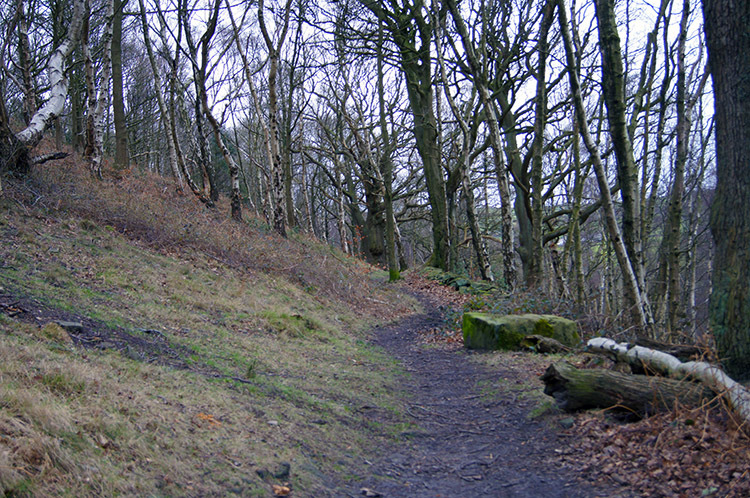 After the moorland crossing there is a number of woods to enjoy on the return via Cottingley and the River Aire. All through the near 14 mile walk there is much to take in, be it beautiful views or industrial heritage. Note: For a shorter 11 mile variation of the walk with the permissive alternative please click here. The Walk: Having posted information about doing this walk on Facebook the day before I did it I was delighted to get a message from Tony Grogan of Nab Wood, Bradford that he would join me for a section of the walk. 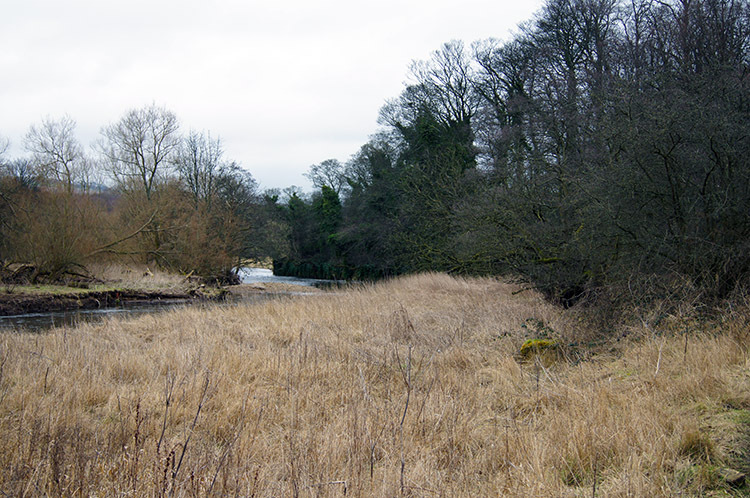 And so, on a decent day in mid-February I made my way across from Harrogate to Shipley and set off on my walk from Shipley along the Leeds-Liverpool canal westward to meet Tony who was waiting on Victoria Bridge in Saltaire. Having made contact by mobile phone as I set off he walked to greet me and so we walked along the canal past Salt's Mill together. 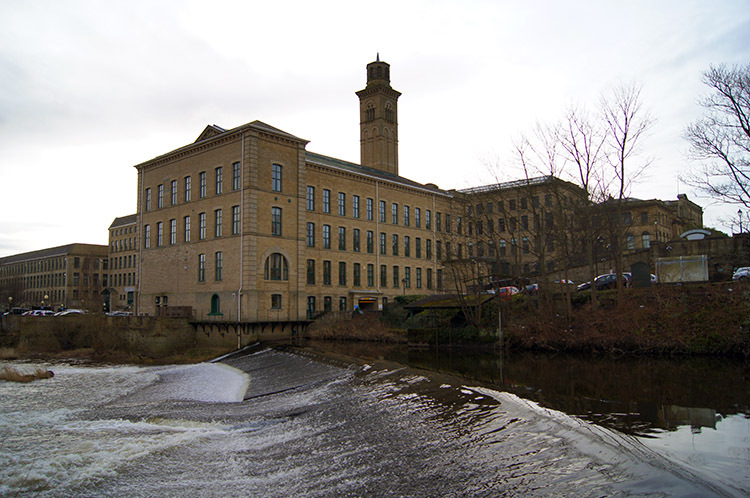 Salt's Mill and the village of Saltaire which I shall walk through on the return journey is a special place to the local community. 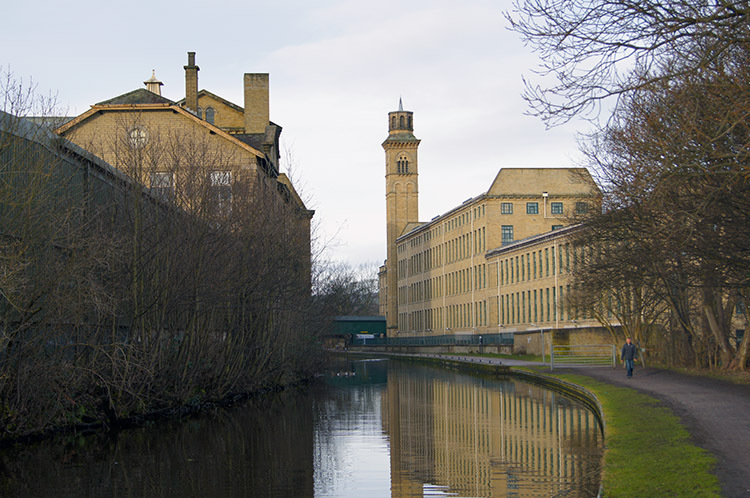 Saltaire and the mill draws visitors from all over the world. It is now a World Heritage Site and named after Sir Titus Salt who built a textile mill and the village on the River Aire. 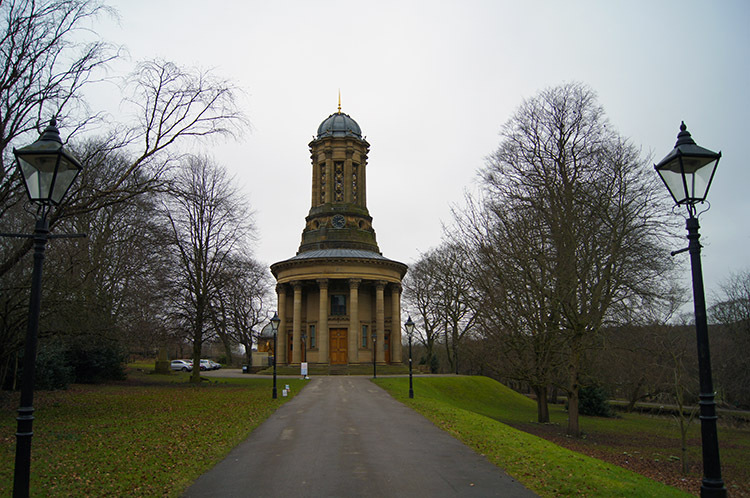 Saltaire received its designation as a World Heritage Site by UNESCO in 2001 and since the accolade has seen visitors numbers increase significantly. The Mill itself is now converted into shops, cafes and galleries, including one dedicated to the work of David Hockney. For more on the Mill and Saltaire visit the official website at http://www.saltsmill.org.uk/ The buildings are impressive and with Tony's knowledge adding to the content of the walk I enjoyed the walk past the mill and associated buildings along the canal side. As it was early morning Tony and I were fortunate not to endure the masses of visitors at Salt's Mill so a peaceful passage of the heritage site was followed by a lovely gentle and quiet walk along the canal past lovely Hirst Wood and toward a stone bridge and series of locks at Dowley Gap. So close to city outskirts, roads and railways and yet so quaintly rural in setting. It was a joy walking along the canal and a joy to be in the company of Tony, fellow walking enthusiast, designer of a Yorkshire Dales route and author of the accompanying guidebook, a Dales Highway. 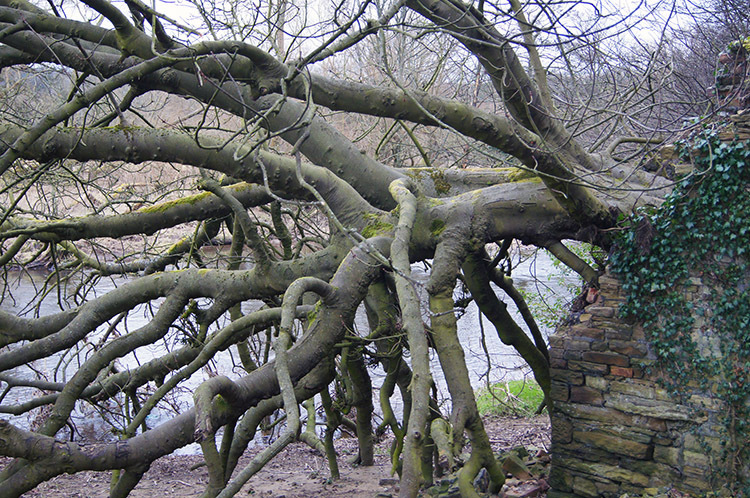 Fancy a different walk? Then take a look at his and his wife Claire's excellent book and new guide book on Dales Rail Trails. Tony and I spoke of our mutual love for walking and writing about it as we strolled along the canal side, so much so that we soon arrived at the famous Bingley Five Rise Locks and the point ending our walk together, but not before we shared a drink in the Five Rise Locks cafe and then bid our farewells. 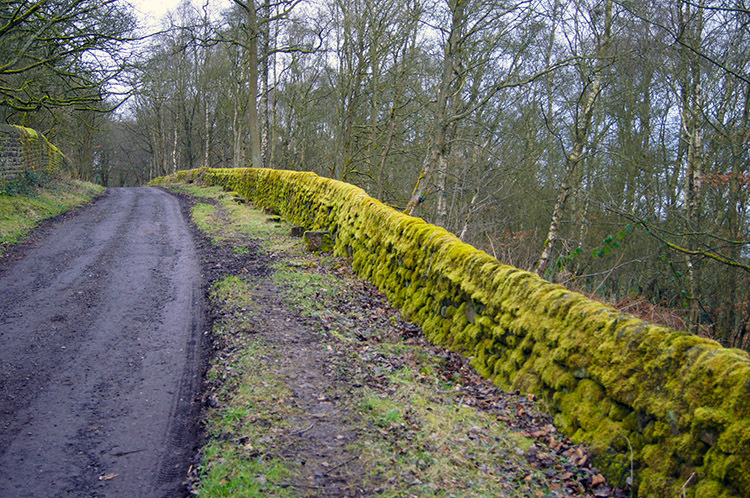 Tony would return home by train, I would continue up onto the moors above Bingley. The change was immediate once I had parted company from Tony. 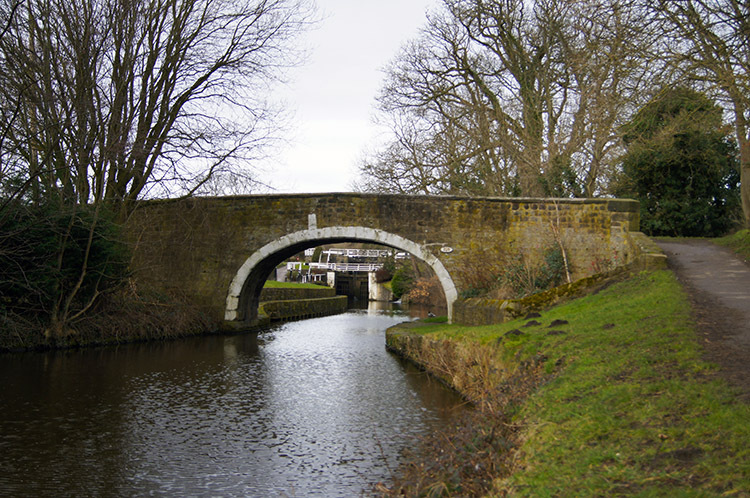 I left the canal side and crossed a high footbridge over the A650 Aire Valley Road into Bingley village. 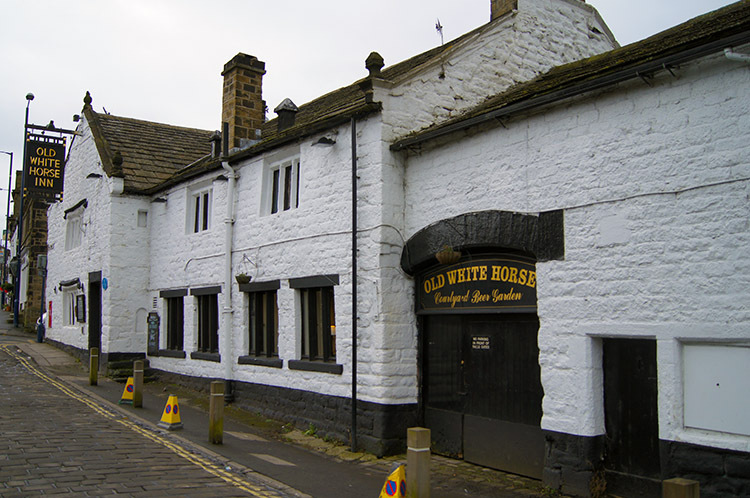 I looked around for a while at the quaint church in the town centre and the whitewashed walls of the Old White Horse Inn. Further on I took time to look at the River Aire rushing under the town bridge before steeling myself for the climb of the day. 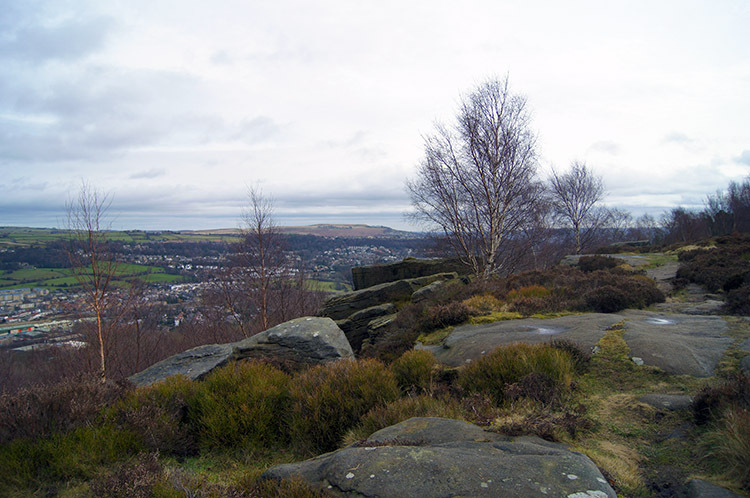 It was now time to leave the Aire valley floor and climb steadily over 200 metres ascent via Altar Lane to Druid's Altar a series of grit stone outcrops looking over the south side of the valley. 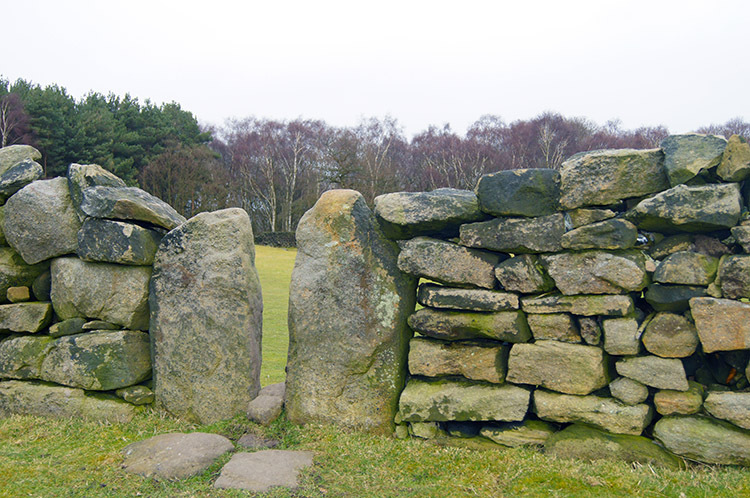 Druid's Altar was a joy to reach as the climb was a steady pull of over a kilometer and with a recent bout of winter cold I struggled to make the climb. I did it without stopping but I did not rush, sometimes making short steps to keep momentum. 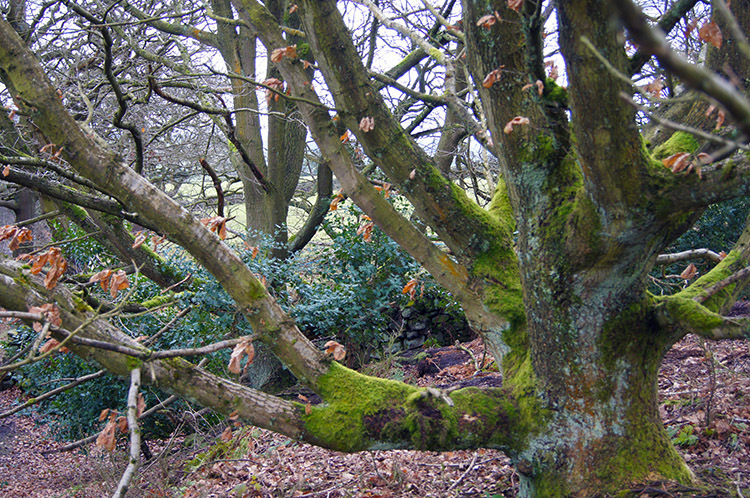 The moss lined walls on Altar Lane and woodland beyond the walls always retained my interest throughout and on one occasion a cheeky Robin enthralled me as he hopped from branch to branch on a tree and took poses between. He knew I was watching and naturally wanted to show off. 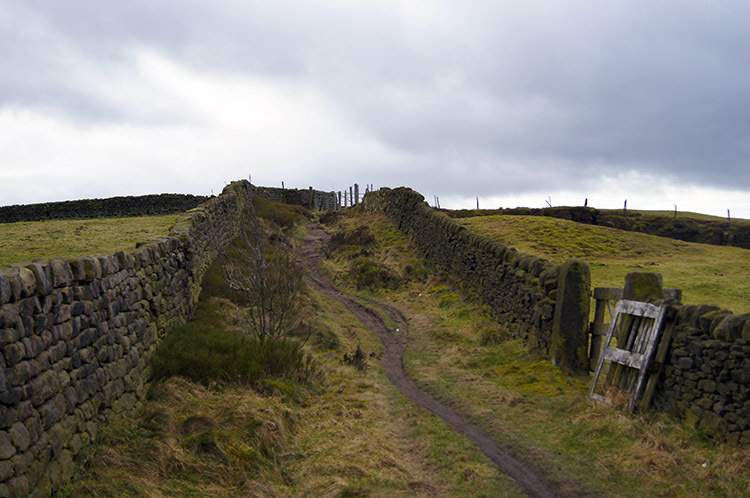 After enjoying the views from Druid's Altar I continued on Altar Lane and then across Keighley Road to Heather Glen, the paths and tracks always interesting as the weaved up the moor between never exactly straight drystone walls. This lack of symmetry made them much the more interesting. The long haul up to the moor eventually levelled out near Heather Glen and from there I could see Harden Moor in the close distance. This time of year the moor is bereft of the bright purple glory but in winter the range of rusty browns take their own centre stage. The range of colour between ground, grass and rock is a subtle one, all are brown dominated but some are smooth and delicate while others sharp and glassy, particularly on the sharper outcrops of stone. It was a beauty all of its own which I enjoyed as I crossed the moor in zigzag fashion, being drawn to one interesting area of the moor after another. 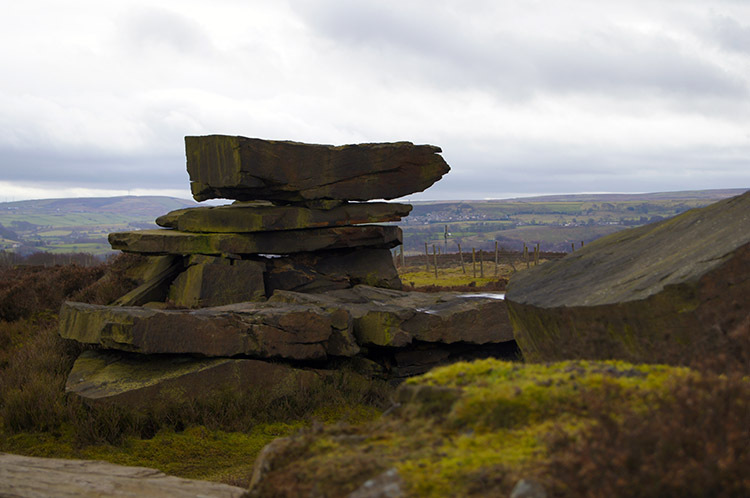 In places of natural outcrop mans activity was clearly evident with many sculpted rock shapes to be found on the moor. 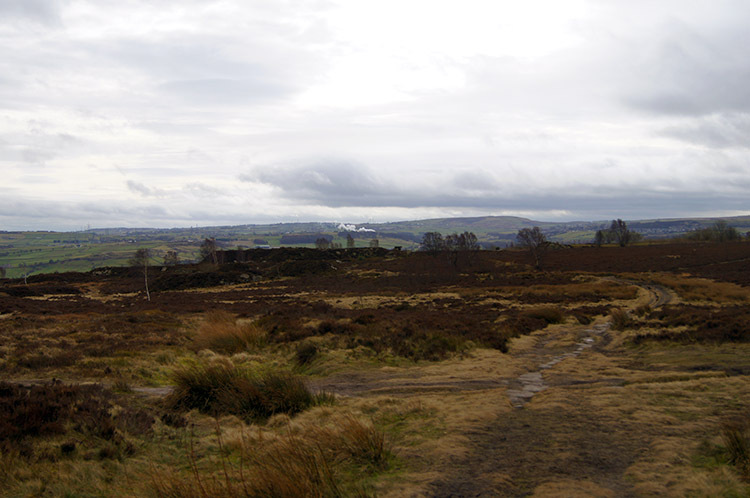 I did not hurry off the moor but my leaving came soon for Harden Moor is a small gem rather than a wide expanse. I dropped down from my highest ground of the day to Ryecroft and then made my way by road and then across fields to skirt Harden village before crossing Harden Beck and onto the Millennium Way via Wilsden Wood where I realised my fatigue and took my lunch break. Warming coffee and lovely sandwiches fuelled me for the walk onward but I did not rush lunch or take off in a hurry. I found the wood to be an enthralling place with fungi protruding from birch wood, green mossed outcrops of millstone and tree shapes keeping my attention for quite a while. Take my leave of the woodland I eventually did and then I continued my walk by crossing open fields to Coplowe Lane and Cross Lane and then to Ruin Bank Wood and Cottingley Wood. The day had been a fair one so far with cloud but sun regularly glinting through but as I crossed the open ground the sky darkened and I endured a short spell of drizzle. Never heavy though and soon gone anyway it was more a fleeting inconvenience than a setting in of wet weather. 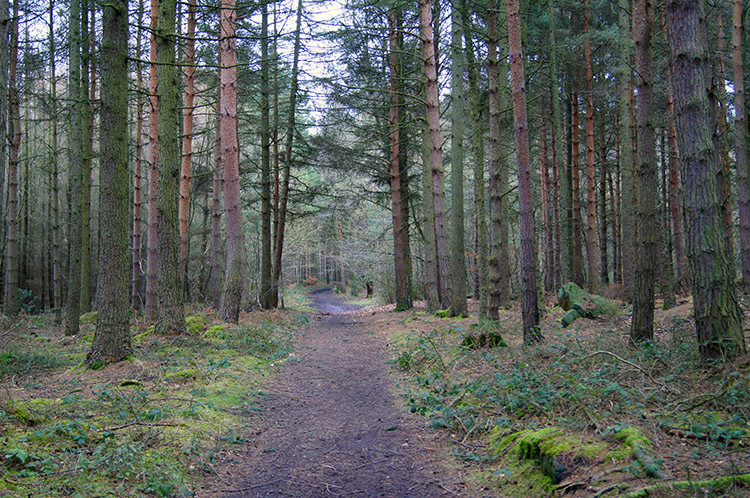 Once into Cottingley Wood I never noticed it again. In the wood I saw tents pitched in various locations, all some distance from the path but with close proximity to urbanisation I wondered if the tent encampment were permanently occupied. A mystery unsolved. My interesting walk never abated, even on the short walk through Cottingley Estate as it was bin collecting day and I watched the activities of the bin men and the local residents, an interaction of politeness and organisation played out once every week (or is it once a fortnight now for some councils bin collections are less frequent than others). To access some streets the large bin wagon had to reverse up, taking the bins at the bottom first and clearing them to residential properties before reversing up to the final bins at the top of the street. Then out of the estate I reached a bridge which took my alongside the River Aire on a downstream course toward Cottingley Viaduct. I passed interesting bridges and Bradford and Bingley Rugby Ground on a surprising interesting riverside walk. I expected lots of rubbish dumped but saw little; I saw more beauty than I thought I would. The walk was well maintained, well managed and to be applauded. I left the riverside at Nab Wood. My finale to the walk was a walk through Saltaire Village. First though I walked through more lovely woodland in Nab Wood and then through the heritage village. 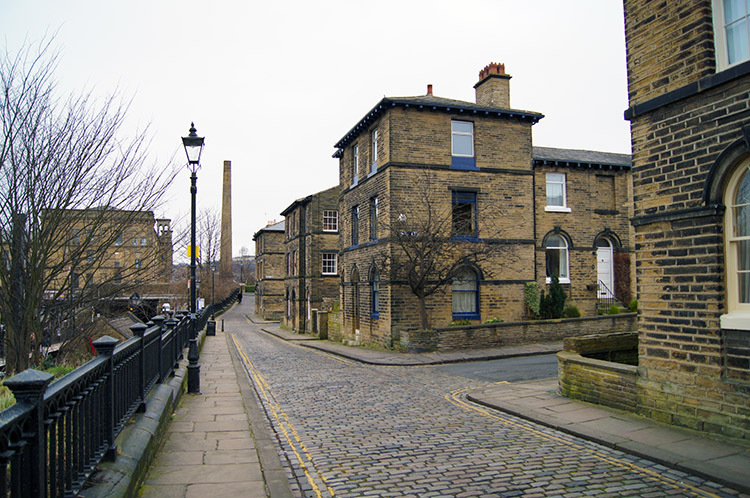 Most streets are named after Titus Salt's eleven children, all the streets are uniform in a grid pattern, all are natural stone built and the whole feel of the village is remarkably Victorian. After passing streets and the railway station I walked past the entrance to Saltaire United Reformed Church, a wonderful edifice. Then I resumed my acquaintance with the Leeds-Liverpool canal and walked past Salt's Mill once more back to Shipley. I was tired but I gloried in the recollection of a superb and varied walk. The joy of canal walking, a glorious moor crossing, a riverside section, excellent varied woodland and industrial heritage in one walk - excellent.